Diamond type is a method of scientifically classifying diamonds, both grown and mined, by the level and type of their chemical impurities. Type IIa diamonds make up 1–2% of all mined diamonds. Type IIa diamonds are almost or entirely devoid of impurities. A colorlessPDC Diamonds is classified as type IIa which is considered to be the purest form of diamond known to man. Many large, famous diamonds, such as the Cullinan and Koh-i-Noor, are type IIa. 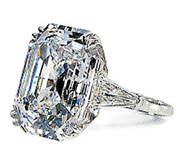 A renowned example is the “Elizabeth Taylor Diamond,” formerly known as the “Krupp Diamond,” a 33.19-carat Type IIa diamond.